Hundreds of passengers wait for SEPTA Regional Rail trains, most of which were canceled, at Jefferson Station. 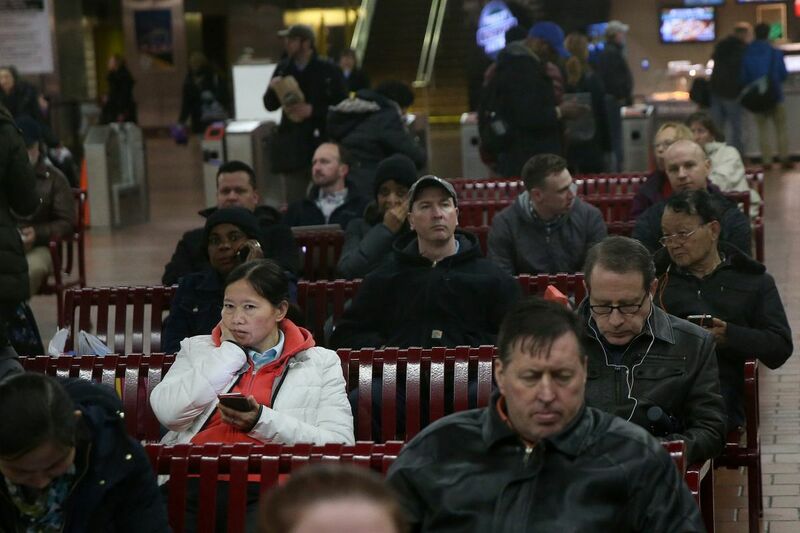 High winds and unexpected whiteout conditions from a powerful nor'easter left commuters across the Philadelphia region stranded at train stations and on roadways Friday, uncertain of when they would be able to get home. Widespread service suspensions on SEPTA and Amtrak forced travelers to cope with long waits or look for other options. Sue Rinaldi, 57, of Skippack, waited at Jefferson Station more than 2½ hours after her Lansdale/Doylestown train was canceled. She expected her normally 50-minute commute to last several hours, as she waited for a Norristown train to take her to the transportation center there, where she hoped to catch a bus or, surge prices permitting, an Uber ride. Sue Rinaldi, 57, of Skippack, awaits a train at Jefferson Station. "It's kind of one of those surprise storms. Everyone is in the same boat. I'm tolerating it," she said. As Rinaldi stood on the platform, a Norristown train glided by without stopping, apparently filled to capacity. Many SEPTA commuters were facing similar struggles, as the agency suspended service on most of its Regional Rail lines by early evening. The few lines that did remain open, like Fox Chase, were running as much as 77 minutes late, and shuttle buses were replacing some trolleys, including on Routes 101 and 102, due to downed wires. Various buses were also being detoured due to weather conditions. Amtrak, meanwhile, suspended all service along the Northeast Corridor until Saturday. Dmitry Schneiderman, 35, of Milwaukee, and Lauren Michaels, 23, of Chicago, got stuck at Jefferson Station when their train was canceled. They decided to take an $80 Uber ride to the airport, hoping their flight to San Francisco would take off. It was a meet not-so-cute. Both were in town for job interviews. Dmitry Schneiderman, 35, of Milwaukee, and Lauren Michaels, 23, of Chicago, got stuck at Jefferson Station. "We're lucky we found each other, so we're splitting it," Michaels said. But the newfound friends may not have had any better luck at Philadelphia International Airport, where more than 400 flights had been canceled. Passengers on Philadelphia-bound flights that were able to land at the airport on Friday morning reported turbulent conditions. At 30th Street Station, every seat in every restaurant was taken by stranded commuters. Some people, like Richard Prebil of Germantown, took seats on the floor. "I'm trying to figure out what to do. First, I have to get my phone charged," Prebil, 25, said sitting next to an electrical outlet. If his Chestnut Hill West train didn't resume running, he said, he'd try to make it home on a bus. Gazing out a large window at 30th Street Station at the snow pelting Market Street, Brian Gallagher was still in decision mode. "It's pretty bad. I was going to get out of the office a little sooner, but I misjudged a bit. So I'm debating whether to stay here or get a hotel," said the Howard County, Md., resident. He commutes to Philly daily on Amtrak for his controller job in Center City. "I also have a brother in Jersey. I could make a call, but he wouldn't be happy," Gallagher said. Trees downed by high winds caused headaches for motorists on area roadways, including eastbound I-76, where as soon as crews got one tree cleared, another fell a mile down the road. CLEARED: Downed tree on I-76 eastbound at Mile Post: 333.0. Downed tree on I-76 eastbound at Mile Post: 334.0. There is a lane restriction. The Philadelphia Streets Department said it had 70 trucks mobilized and more than 40,000 tons of salt ready to treat "primary streets in problem areas." "Motorists are urged to use caution because high winds can limit visibility," city officials said in a statement. "The accumulation, however, is mainly on grass and sidewalks, with a little accumulation on bridges and some streets, especially in the Northwest." Many people stranded at train stations who tried to catch ride-hailing cars home encountered surge pricing, like Lisa Capparella, 36, of North Wales. After waiting for hours at Jefferson Station for her train, she saw that an Uber home would cost her a cool $180. Capparella was losing hope. The SEPTA staffers told her a cab was her best bet. "I'm honestly thinking of going to a bar and getting a drink," she said. "I don't think it's going to get better any time soon." Other commuters, like Fred Keeney, 46, of Glenside, said the lack of updated information bothered him most. Keeney said he doesn't trust SEPTA's app, the in-station notification boards, or even the station ambassadors, who, when asked which train was pulling into Jefferson Station, told riders they would have to find out for themselves. "It's a horrible way to end the week," he said. For the latest SEPTA transit updates, commuters are urged to check the system status page on the agency’s website. For updated information on area highways, visit transportation department websites at 511PA.com or 511nj.org.